Yellowfin fielded a team of six runners for the 8th annual CityLink Run for the Kids 2013 15km long course event on Sunday 24 March. The race – held in Melbourne, Australia (Yellowfin’s international headquarters) – takes in the Domain Tunnel, Bolte Bridge, Docklands and Southbank. This year saw a record 35,000 participants, and raised $2 million dollars for Melbourne’s Royal Children’s Hospital. From left to right: Jacob Duncan (Product Developer), Simone Clancy (Senior Account Manager), Brett Churchill (Senior Consultant), James Bardsley (Senior Data Visualization Engineer), and Bryce Hoffman (Accounts Payable Manager). Edward Thomas (Product Developer) also participated but was unable to make the team photo. Yellowfin’s new corporate sports shirts got plenty of attention as Team Yellowfin raced around the course – thanks Brett! Whilst charity was the event’s overarching focus, the ‘in-house’ rivalry was intense. The fastest participant from Team Yellowfin was the ironically dubbed “Unco Dunco”, with a blisteringly quick 1:12:00. Next across the finish line was Bryce, at 1:17:23, showing the speed he’ll undoubtedly use when he inevitably takes-off with our money and heads to Mexico. Simone duped everyone by claiming she had a cold, then running a commendable 1:18:59. Brett ran his race at a mild warm-up pace of 1:25:38 – then went straight off to play a bunch of hockey games because he’s a glutton for punishment. Ned picked up an injury, but managed to drag his crippled knee through the finishing tape in 1:40:21. And James brought-up-the-rear with an ego-bruising 1:43:16. 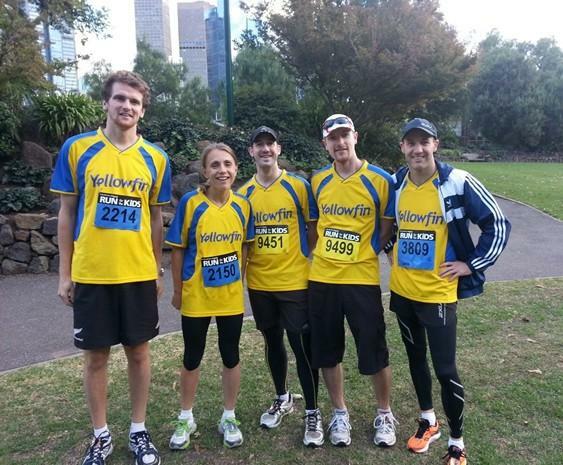 It’s now onwards and upwards, as Team Yellowfin aims to take on the Run Melbourne half Marathon in July.